VW Group has put a new spin on its all-electric I.D. Buzz Cargo van concept. This time, the German automaker has reimagined the concept as a support vehicle for the Volkswagen I.D. R, the electric vehicle prototype that had a record-breaking run this year in the Pikes Peak International Hill Climb competition. VW Group’s commercial vehicles unit unveiled Tuesday the I.D. Buzz Cargo van — with a livery that mimics the R’s colors and includes the course map for the race — at the 2018 LA Auto Show. VW Group also showed off its all-electric cargo bike. Both of these concepts were first unveiled at the 69th IAA Commercial Vehicles show in Hanover, Germany in September. The I.D. Buzz Cargo is meant to be the commercial equivalent of the I.D. Buzz microbus revealed in 2017. 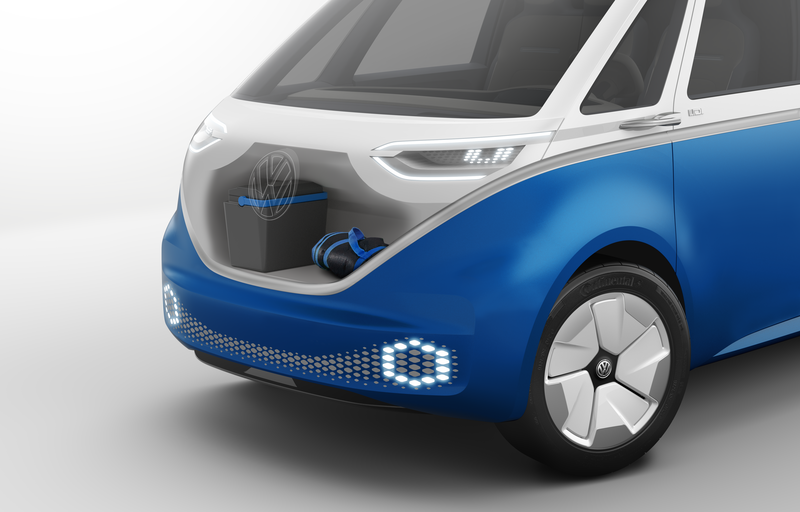 The cargo van concept is longer and has smaller 20-inch wheels than the microbus shown last year and features a short front overhang. The van gets 340 miles on a single battery charge (under the WLTP cycle) and has a solar roof that can extend the range up to 9.3 miles a day. The vehicle’s front and sliding door can be unlocked via a sensor, a nod to a future when autonomous vehicles deliver items to customers. Users can unlock the vehicle from the outside via a sensor that recognizes authorized persons via a digital key, which is sent to the van from a smartphone. The van also has wide-open rear doors that when opened reveal a shelving system that is “connected” to allow all items to be tracked. The van is also equipped with LED headlights that illuminate the road and communicates interactively with pedestrians. Concepts are a funny thing in the automotive world. They often never become reality. Instead, concepts should be viewed as a compass of sorts that shows where a particular automaker might be headed. 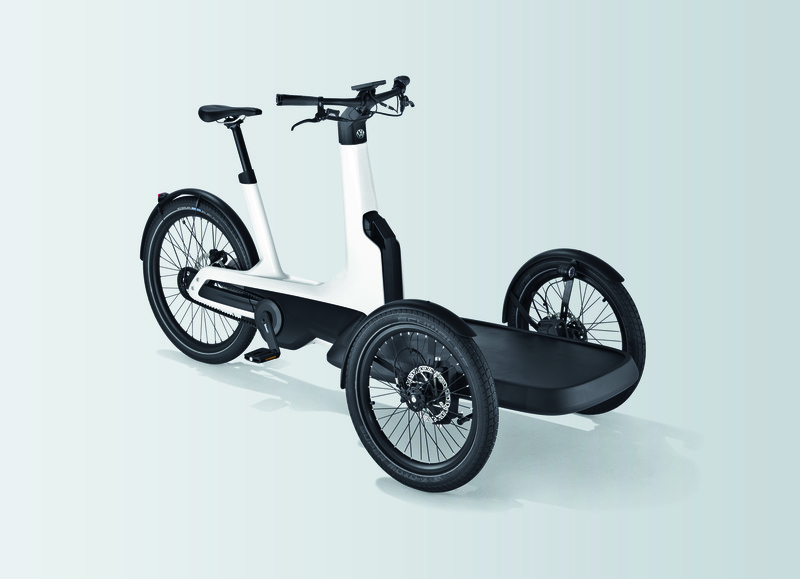 In this case, the e-Cargo bike is slated for production — and soon. The three-wheel bike, which is expected to come to market in 2019, features a 250-watt motor powered by a lithium-ion battery. The cargo bike can carry a payload of 463 pounds and is designed to keep the load platform horizontal in turns. The I.D. Buzz Cargo, meanwhile, “could” go into production in Europe by 2022, if VW commits to making the vehicle at all. Still the I.D. Buzz Cargo, even if it’s never made, provides some insight into VW’s plans. The cargo van is based on the company’s Modular Electric Drive Kit, or MEB, a modular design for electric cars that it introduced in 2016. The first vehicles produced with the MEB design are expected to be in production by the end of 2019. The company has said that the MEB platform will allow it to build electric vehicles more efficiently. The company is charging forward with its electric vehicle plans. The company has booked production for 15 million electric cars, VW CEO Herbert Deiss said in a recent interview with Automotive News.